The Rebel Media’s Jack Posobiec is the latest member of a community of far-right and “alt-right” internet trolls to gain access to the White House press briefings under the guise of journalism. Posobiec has promoted emails and forged documents allegedly related to French President-elect Emmanuel Macron, the baseless “Pizzagate” conspiracy theory, false pro-Trump smear campaigns, and has worked with other “alt-right” media figures and outlets. Almost all cable and broadcast news morning shows reported on President Donald Trump inviting the abusive authoritarian president of the Philippines, Rodrigo Duterte, to visit the White House, mentioning Duterte’s record of human rights abuses. The only morning show of a major network to not cover the story was Fox & Friends, which made no mention of Trump’s invitation or Duterte’s human rights abuses. 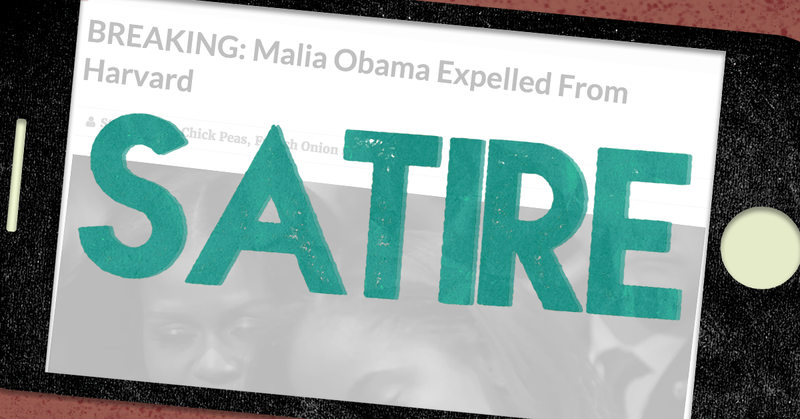 Fake news purveyors recently cited a satirical entertainment article that falsely claimed Malia Obama was expelled from Harvard University, demonstrating how fake news purveyors repurpose and manufacture fake news online. The post was first published by Last Line of Defense, a website that declares on its “About Us” page, “All articles should be considered satirical and any and all quotes attributed to actual people complete and total baloney.” The site claimed that Obama, the daughter of former President Barack Obama, was expelled from Harvard University after she was caught ”vaping marijuana with friends” in “a Boston hotel lounge” and therefore was breaking the school’s anti-drug policy. The satirical article also claimed that the Obama family’s lawyer “is planning on filing a discrimination suit, because isn’t everything about race?” On April 10, Snopes debunked the article as false, noting that “Malia Obama was not expelled from Harvard University for smoking marijuana” and that, although the young Obama has been accepted at Harvard, she hasn’t started attending the university yet. Although the story was fabricated for entertainment and was intended to mock conservatives, it was quickly picked up by serial fake news purveyors. Sites including US Headline, Southern Conservative, Anews-24, Conservative Info Corner, We Conservative, USA Daily Post, and Flash News Corner published their own versions of the satirical story under the banner of journalism. According to Buzzsumo, a social media analytics site, 16 articles about the claim were shared 43,292 times across Facebook between April 4 and April 11. Fake news purveyors sometimes cite satirical news sites such as Last Line of Defense, repackaging and transforming pieces that originated as entertainment into fake news that reinforces the purveyor's tone or agenda. These sites then distribute them to hyperpartisan social media audiences on Facebook, whose newsfeed algorithms search -- based on images or articles the users have engaged with in the past -- for content that reinforces users’ beliefs in what is known as a filter bubble. Last Line of Defense was also the source of a fake story that claimed that two congressmen were caught plotting President Donald Trump’s assassination. PolitiFact rated the story “pants on fire” false and noted that the hoax had spread to fake news sites. It was shared more than 20,000 times on Facebook as of April 11, according to Buzzsumo. Media Matters has mapped out the fake news universe, concluding that satirical political entertainment sites are not inherently “fake news purveyors” on their own because their media is designed to entertain or inspire consumers, rather than to intentionally deceive them. Satire sites manufacture their laughs and clicks by fabricating stories that play to presupposed notions of the audiences they intend to mock. In this example, Last Line of Defense played to right-wing speculation about marijuana usage by Malia Obama, inspired by a video that emerged last year that depicted Obama smoking what appears to be marijuana and about a “shadow government” conspiracy to take down Trump, which unintentionally became fodder for purveyors of hyperpartisan fake news.